Today's recipe...Kit Kat Cake! I saw a gorgeous picture of this cake from Recipe Girl, and it was so great looking that I knew I had to make it, I just didn't know what to make it for. 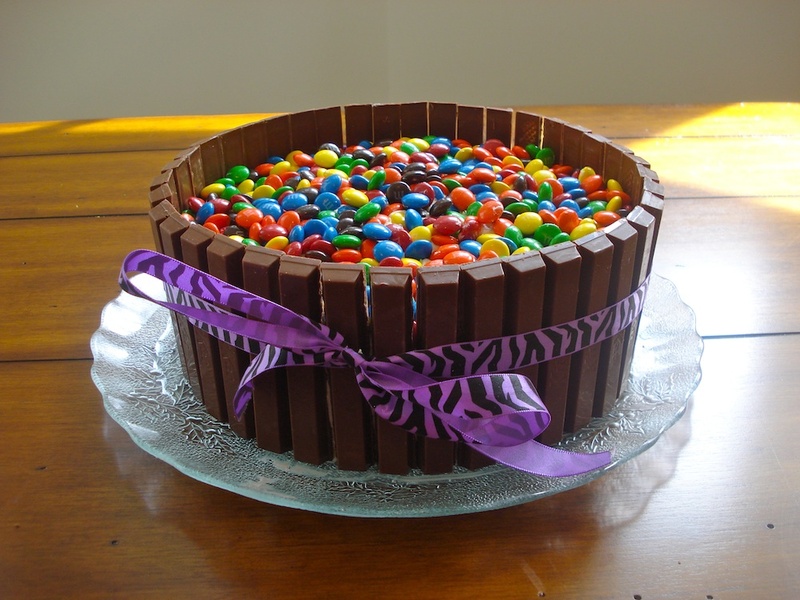 I mean, I like cake, but making this whole thing for just my family would be too much. Well, the time has come, because TODAY is my sister's birthday! Okay, so I didn't make it for her real birthday, but I made it for her party. 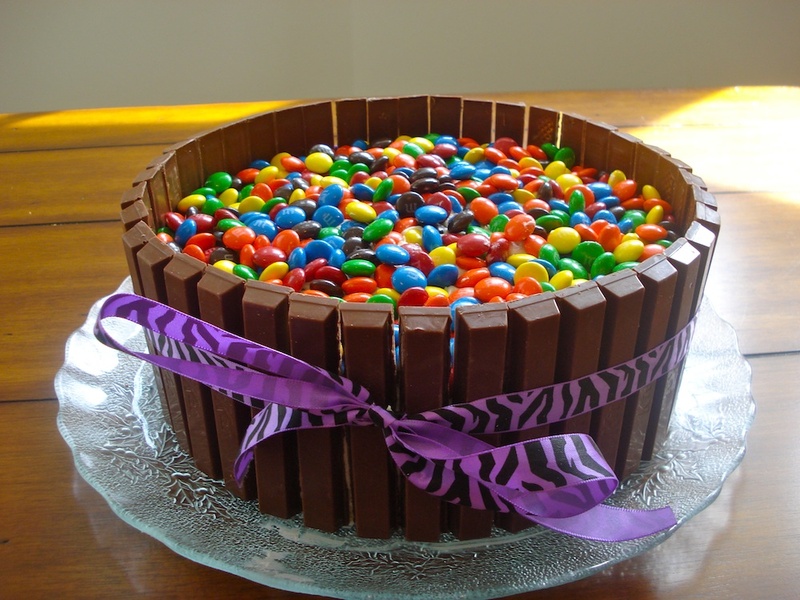 Twelve ten-year-olds gave this cake the thumbs up! I have to agree, it looks pretty impressive, but it's super easy to make! You start out by baking a recipe for a 9-inch round layer cake. 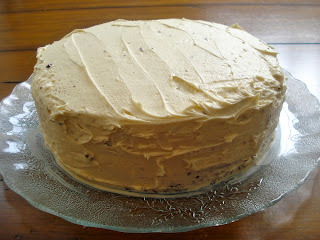 I made my favourite chocolate cake recipe from scratch, but you could make vanilla, or use a boxed mix. 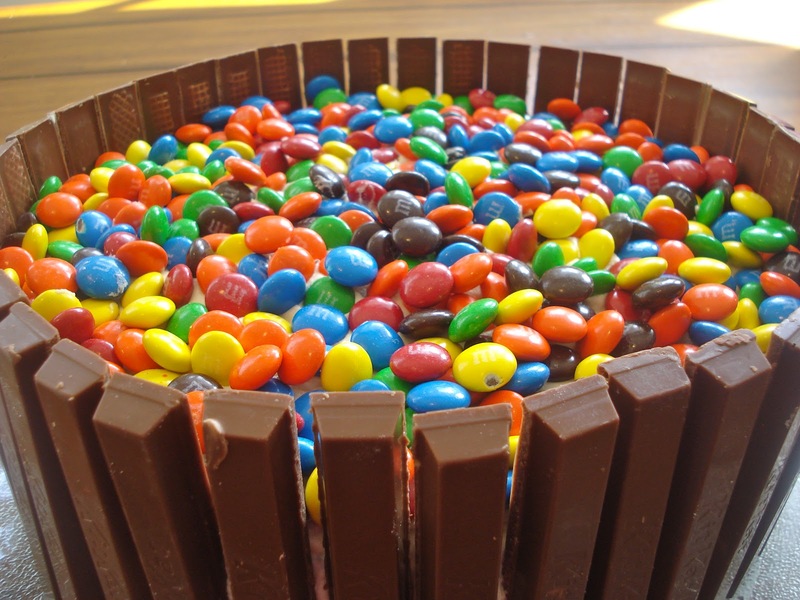 Then you cover it in icing like you would a normal cake. I used eleven in total, but depending on how you space your kit kat sticks, you may need more or less. Fill 'er up! I used just enough m&ms to cover the top of the cake (so you couldn't see the frosting), but you could pile them up all the way to the top of the kit kats if you wanted! Then tie a pretty ribbon around the cake, and you're all done! It's so fast and easy, and it looks (and tastes!) fantastic. This is definitely one you'll want to try out! To make icing, beat butter with beaters or in the bowl of a stand mixer for about 2 minutes. Add in the powdered sugar, a little at a time, and beat until combined, about 3 minutes. Add in vanilla and salt, and beat again to incorporate. Frost cake all over. 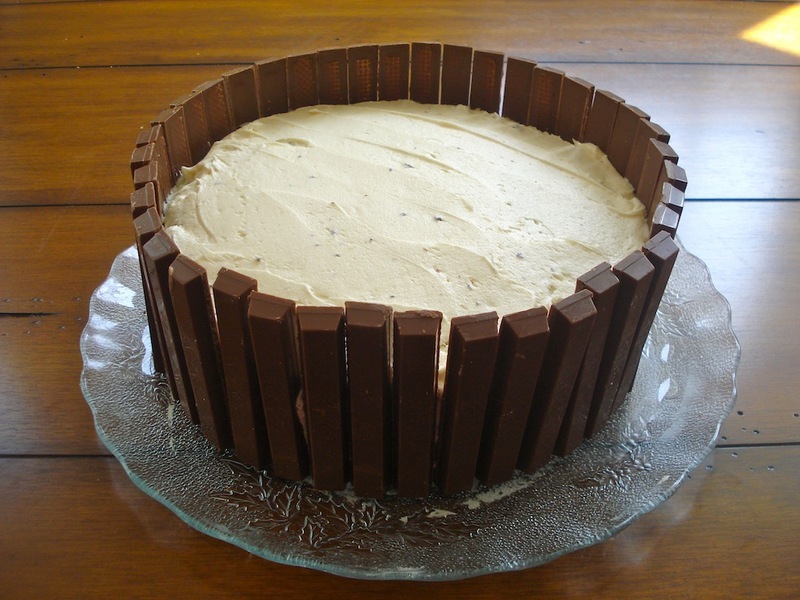 Arrange Kit Kat wafers along the sides. Pour M&Ms on top, using enough to cover top so icing is not visible. Wrap ribbon around cake and tie with a bow, if desired. Beautiful looking cake! That is a lot of Kit Kats> I am sure it tasted as good as it looks. How cute is this cake?! No cake decorating skills required.